Bermudian Nahki Wells will reportedly undergo a medical at QPR today [Aug 23] “ahead of a season-long loan move” according to British media SkySports. The Bermudian footballer was a star striker for Huddersfield before moving to Burnley in a multi-million dollar transfer last year, however Burnley has not afforded Wells much playing time, with the Bermudian making only ten appearances for the club, all as a substitute. 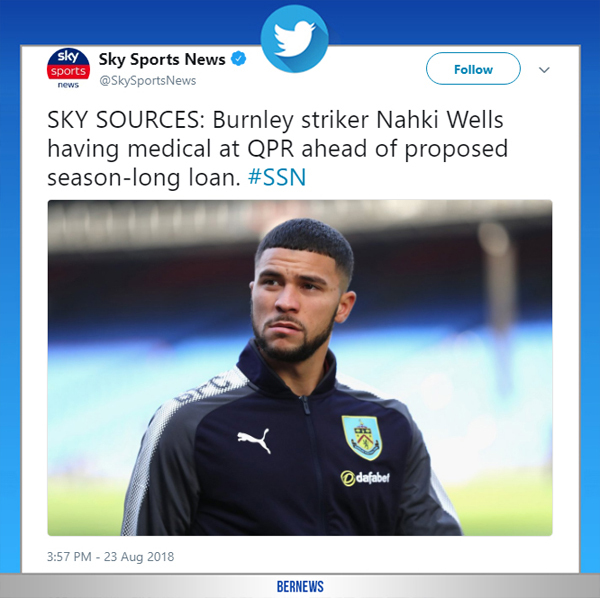 The SkySports story said, “Burnley striker Nahki Wells will undergo a medical at QPR on Thursday ahead of a season-long loan move, according to Sky sources. The striker has been in discussions over the move over the last few days. “Wells is set to join on a year-long loan deal that is understood not to include any option or obligation to buy him permanently. “The 28-year-old has been on the market all summer and had talks with Derby over a potential loan while Burnley were signing Matej Vydra from the Rams. “Wells joined Burnley from Huddersfield for £5m in 2017 but he is yet to begin a match for the Clarets in any competition.